It was nice to get there a little later on a Sunday, just in time for breakfast. We cut it close, but we were able to still order breakfast. 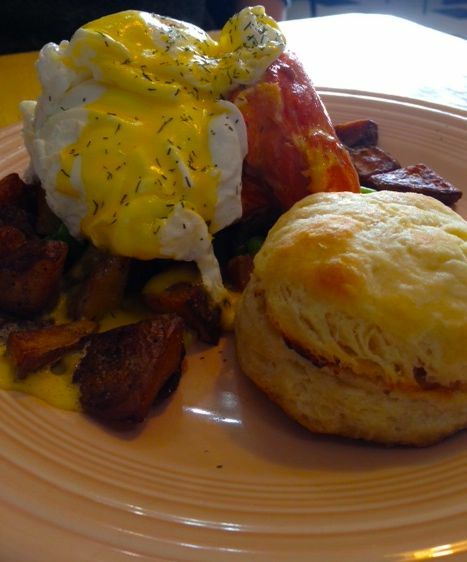 There were many scrumptious things on the menu, but as always, I chose the Eggs Benedict. My husband and friend both got the Shipwreck or Trainwreck, not sure of the name. The other gal ordered an omelet. Since the place was rather quiet, our food came out in a timely manner. The Shipwreck/trainwreck was a really great presentation. It was a smoked salmon on potatoes, with eggs, drizzled in a hollandaise sauce. It was fantastic. It was also served with a biscuit. This biscuit is amazing. Pine State needs to call and get this recipe, because they have got a great biscuit and they even grilled it before they served it. Yum!! I was pleased with my eggs benedict. The sauce was great, and let me tell you the hollandaise can make or break a good benedict. 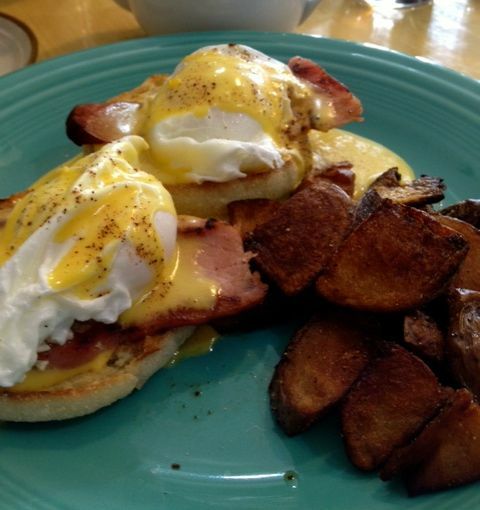 There was thick chunks of ham on my benedict, which I like much better than salty deli ham, so that was a bonus. My husbands dish has so much smoked salmon I was actually stealing that for my dish. Let me tell you, I just might try and go back and order a smoked salmon benedict next time, even though it’s not on the menu because that was pretty awesome. The general consensus was that the potatoes were not that good. I was actually the only one that liked them. I did think they seemed a little over done, but I really like the flavor. Nonetheless, I was alone in thinking that. I liked them and I ate all of mine. It is awesome to see Sherwood have such a great local diner. We all left happy and we all agreed we would be back. Atmosphere was a typical diner. Nothing fancy, nothing to write home about. Service was good. They always checked on us, kept things full, but they were kind of shy, so not a lot of interaction. Pricing was a bit high I think for a little town. Usually $12 for benedicts I am ordering a specialty one, not a typical one. Tea was Stash, not sure what coffee was, but husband said it was ok. Fat Milo’s is located in Old Town Sherwood.